There’s an event you won’t want to miss on Sunday, August 28, 2011 if you’re in the area. 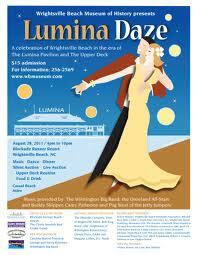 Just a short drive from your Ocean Isle Beach Rentals the event, Lumina Daze, will take place from 4-10 p.m. at The Blockade Runner Beach Resort, 275 Waynick Boulevard, Wrightsville Beach, NC. This evening of fun will benefit Wrightsville Beach Museum and feature shag, jazz and big band music. Music will be provided by Wilmington Big Band, Buddy Skipper and the Jetty Jumpers with Carey Patterson and Pug West, Phil and Mark, and the Dixieland All-Stars. New this year is a Live Auction in addition to our popular Silent Auction. Silent Auction items will include a wide assortment of fine art, services, and specialties from local businesses. Stroll through areas with presentations on themes relating to Wrightsville Beach history. Upper Deck Reunion is in the works! Please bring to Lumina Daze any Upper Deck memorabilia that you would like to share. Food and drink will be plentiful and for sale. Ticket price for the event is $15. Tickets can be picked up at the door at Lumina Daze or from the museum before 5:00 on Thursday, August 25th. For more information call (910) 256-2569 or email info@wbmuseum.com. Give us a call at Sloane Realty if you’re looking for Ocean Isle Beach Rentals. We’d be happy to show you what we have available during your time in North Carolina.